However, one man was watched more closely than any of the others: Dan Gurney. Gurney was not a NASCAR regular by any means, yet he had won the Riverside 500-miler three times in a row, from 1963 to 1965. By all accounts, the 1966 edition was his to lose, and there was plenty of driving talent at that race eager to end his winning streak. But not this year. 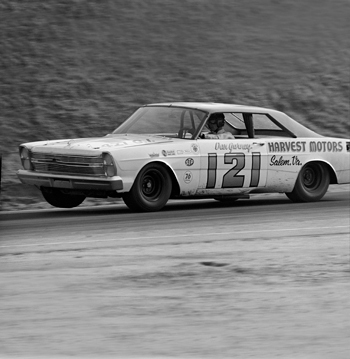 After five hours of racing, Gurney’s Ford Galaxie won, finishing 70 seconds ahead of David Pearson’s Dodge at an average speed of just under 98 mph. In the ’60s, most of Gurney’s wheel time was spent in Formula 1 cars, sports cars and Indy cars, making him something of an outsider among the NASCAR elite. But the handling skills he honed on Europe’s road courses put him a step ahead when it came to Riverside’s undulating, 2.7-mile, nine-turn track—ground unfamiliar to NASCAR drivers better acquainted with ovals. His endurance road-racing experience also taught him how to make a car’s components last for a grueling 500 miles. That would be especially important when it came to saving the brakes, as NASCAR-contending American sedans in the mid-’60s were, even under the best of circumstances, under-braked for their weight. Motor Trend’s John Ethridge, writing up the race in the magazine’s April 1966 issue, said Gurney “never appeared to over-extend himself, even during qualifying. Indeed, most of the time it seemed he wasn’t even trying. Per usual, he ran most of the race (147 out of 185 laps) out front, often running lap after lap without varying his line through a given turn more than a few inches, or his lap times more than a few tenths of a second.” After swapping the lead a few times with Pearson and Curtis Turner, Gurney moved in front on lap 84 and stayed there until the race’s end. Gurney, who passed away from complications from pneumonia in January at age 86, would win the Motor Trend 500 one more time, in 1968—a string of victories that caused some to re-name the event the Gurney 500. Those five were among the more than 50 wins he earned in a driving career that began in the mid-’50s. Fittingly, he retired from driving following the 1970 Motor Trend 500 at his home track, Riverside.